UC Berkeley campus and its environs are not immune to crime, but your awareness can reduce the incidence of crime. Stay aware of current crime activity in the best way for you. On this website, the Crime Alerts page has links to all current Timely Warnings that have been published on Nixle. They are also on our front page. The UC Police Department's continuing goal has been to broaden the communication channels between law enforcement and the campus community. In June 2015, the Office of the Chief began collaborating with San Francisco-based Nixle to provide a more robust system of communicating about situations that may affect safety on and around the UC Berkeley campus. If you have an official Berkeley email address, you are automatically added to UC Berkeley's Private Group for messages about safety and congestion in campus areas. To modify your UC Berkeley Private Group notification settings on Nixle, go to your most recent email from Nixle, scroll to the bottom, and find the text "To manage your email settings, click here." You can also refer to this comprehensive FAQ about the UCPD Nixle Alert Partnership. 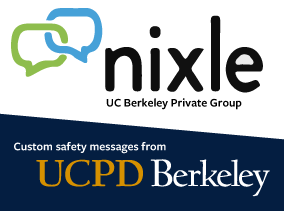 See the most recent messages from University of California Police Department, Berkeley, powered by Nixle. If you have a CalNet Identity, you have been added to the UC Berkeley Private Group to receive custom safety messages from UCPD via Nixle.